Sophisticated curved low back and soft sofa cushion provides ultimate seating comfort suitable for longer sittings. You can even use them as occasional chairs in the bedroom or living room. ➧BUY Chairs at fixed Price NOW. Floor to Seat Height: 48 cm. The upholstery fabric feels and looks like nicely worn leather. Table is not for sale. ONE ORDER=TWO CHAIRS. Color: Light Grey. Floor to Seat Height: 48.5 cm. Seat Width&Depth: 42 × 43 cm. Otherwise we will need to ask for this information before we are able to answer you. Can be used as dining chairs, lounge, restaurant or office chairs. More COLOR Chairs And More Black Chairs. 4 CHAIRS WITHOUT TABLE. 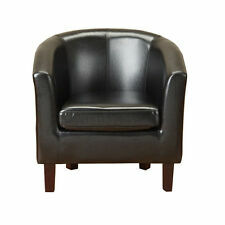 Foam padded seats provide a more comfortable seating experience. Colour:BLACK WHITE SIDE. Kitchen, Dining & Bar. 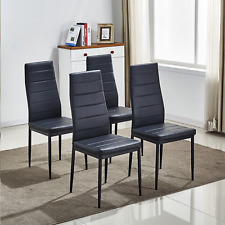 Black Stripes PU leather parsons seat makes it tidy and easy to clean,Lightly cushioned chairs to add comfort. Type: Dining Chair. Sleek design with modern appearance brings a contemporary atmosphere into your kitchen or dining room. 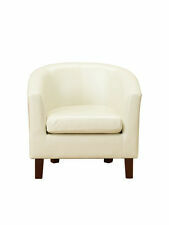 ➤ The back rest will nestle into your back ensuring comfort and stability. ➤ So brighten up your decor with the comfortable and practical bar chair. ➤ A vibrant powder coating adds to the overall look of the chair. kitchen chairs . Condition is Used . 4chairs are from a POGGENPOHL kitchen . they can be used indoor or outdoors . very unusual , very strong chairs . because of size and weight , pick up is recommended . no postage. 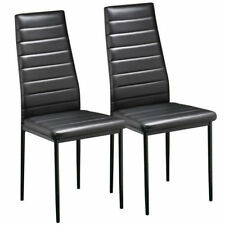 height of chair 29inches , height to seat 17incches , width 21inches . 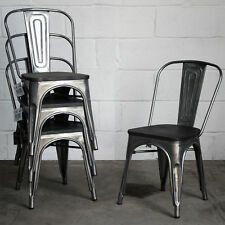 2 modern retro design kitchen chairs/dining chairs.